Why is working barefoot so good for your brain, body, and soul? Learn about the benefits of working barefoot at Outpost and the many ways that this coworking space is dedicated to healthy work ergonomics and culture. 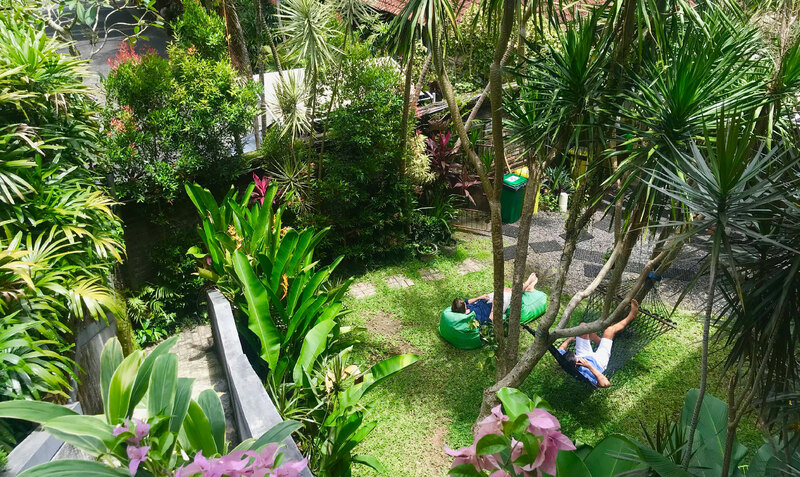 One of the first things I noticed about visiting the coworking and coliving spaces of Outpost, Ubud is that everyone was entering the space by first removing their shoes. I guess this is not really special in Asia as many restaurants and community spaces have you remove your shoes before entering, but being the American that I am, it is something that made me feel cozy and comfortable. Outpost has a wooded feeling that reminds me of that farm which takes me closer to nature. I’m going to honor Outpost for this reason and give a general overview of why they are special. There are many things that I really enjoyed about Outpost, Ubud. In particular, I found their rooftop to be my preferred space to work. There is lots of great light and views overlooking beautiful sunsets. There are swinging chairs and bouncy ball which keeps good posture and relaxes the mind. I also enjoyed spending time in the garden in a bean bag chair where I could put my feet in the soil. In terms of their coliving location, there are many desirable elements. I enjoyed the private pool in each of the villas and the comfortable mattress. I felt the staff was exceptional and helpful. One of the things I loved most about coliving in Uub was the friends I made. They organized a dinner for me and I got to know some of the people staying there and really made some great friendships. While I didn’t get a chance to visit Outpost, Canggu, I did stay nearby for a few days and I got to understand the vibe there. This scene is more hipster modern beachy than anything I’ve been exposed to. Outpost, Canggu is known for events and meetups. It’s a place to find friends from all over the world. Outpost Phnom Penh, Cambodia I’ve been told is really the hidden gem. The building is covered with vines which makes you feel closer to nature both in the air quality and in aesthetic. The rooftop on the 8th floor has an amazing view of the city and sunsets. The coliving space is situated on the 7th floor and is small/intimate enough that only about 20 people stay at a time. There is everything from a dorm room to a 3 bedroom suite with a beautiful jacuzzi with floor to ceiling windows. There’s a “quiet zone” right out front where people can work in silence. Overall I’m a big fan of Outpost. They have an earthy friendly cultural focus in the middle of the urban jungle. They support a large number of philanthropic organizations and employ backgrounds of all shapes and sizes. They really make an effort to hire locally. My suggestion is to get the one pass membership in which you can live/work in all 3 of their locations.